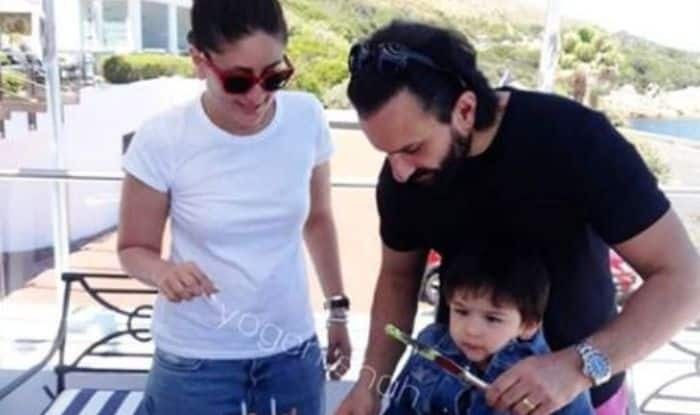 Saif Ali Khan and Kareena Kapoor Khan are currently in Cape Town South Africa celebrating their little one Taimur Ali Khan‘s second birthday. Their holiday pictures have taken the internet by storm. A recent picture of theirs is now going viral where Taimur can be seen along with his parents getting ready to cut his birthday cake. In this recent picture of Taimur, he can be seen with mommy and daddy gearing up for his cake cutting ceremony. While mommy Kareena was sporting a basic white t-shirt, daddy Saif was also seen dressed in a casual black t-shirt. Birthday boy Taimur’s cool outfit will surely melt your heart. Dressed in a Denim jacket and red pants, Taimur sat on the table to cut the cute. Saif and Kareena had earlier held a birthday bash for Taimur before leaving for Cape Town where many celebrity kids were spotted. The Khan family’s vacation pictures are going viral on the internet and Taimur is like the cherry on the cake adding cuteness to every picture. The paparazzi back in India is definitely missing their favourite buddy. In one of the pictures, Saif and Kareena are seen sunbathing with their beachy outfits on. Saif is seen sporting a blue and white striped shirt and white shorts. Kareena, on the other hand, donned a breezy white sleeveless dress. She accessorised her look with a cool yellow hairband, shades and a bracelet. In another picture, Saif can be seen having fun with his boy Taimur. Both daddy and son twinned in blue outfits. One of the cutest pictures from their vacation was the one where Kareena and Saif are posing for the camera along with Taimur. Taimur stole the thunder with his adorable smile. Taimur has never been intimated by the camera and it is pretty evident by his reactions to the paparazzi. In fact, a few days back, Taimur had left his mother’s hand and ran towards the shutterbugs. Taimur is one celebrity kid who is loved by all. It is because of his friendly and jolly nature that everyone tends to fall for this little munchkin. Every picture and video of his goes viral in just a few seconds and why not, this kid is just way too cute to be ignored. In fact, Taimur’s has so many fan followers that people in the market has even come up with a doll of his that is an exact replica of little Nawab. We wish this Saif and Kareena’s little one a very Happy Birthday!